You are sitting at a dinner table. Perhaps at a wedding or a large birthday party. Seated around you are strangers, all with different backgrounds and different occupations from you. As the dinner moves on, the talk around the table turns to your respective careers. One is a doctor, another a teacher, the person next to you is a gardener. You are a logistician. The silence around you is almost touchable. You would have gotten more response if you told them you worked as a parking inspector. Do you recognize the situation? What do you do? What do you say? How would you explain logistics to someone without prior knowledge? Is it even possible? Within the academic world (and in other places as well) there sometimes exists a kind of elitism. This can take various shapes and forms. In some fields, an us-and-them mentality is nurtured where only the ones that have walked the same paths and climbed the same obstacles are welcome. In education this behavior can be extra clear. One maxim that is often encountered is ”It was hard for me – it should be hard for you as well”. I disgree. If something was hard for me to learn, I want it to be easier for you. Then you can reach further, right? Do you recognize it? Of course you do. That’s the whole point. Everyone has been at McDonald’s. Everyone knows how it works in general terms since the system is open and visible. In the middle is a person that acts as a waystation for finished products. It is his/her role to order from the factories and to offer a product range for the resellers to choose from. One of the problems for the wholesaler is to maintain the service level, i.e. no shortages. If this occurs, the wholesaler must forward the orders to the factories and later – when the product is in stock once more – deliver to the reseller who delivers to the customer (some of the items are made on demand, like Filet-O-Fish). The teller takes orders from the customer and delivers products, partly from the wholesaler but also from local warehousing (dip sauce from the dispenser on the counter). Some of the production may also be performed by the reseller (fries, drinks). In logistics this is called ”postponement”. You wait as long as possible with the final assembly so that the customer can choose from a large range of alternatives built from a limited set of component types (”do you want ice in you soft drink?”). 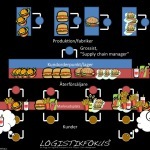 The factories, or the guys in the back making the burgers, produce on orders from the wholesaler. Sometimes, a customer gives a ”special order” (a Big Mac without cheese, for instance). In this case, the order is forwarded directly from the reseller through the wholeseller and to the producer. The article – now customer specific – is produced and distributed in a dedicated channel all the way to the cunstomer (it is labelled with a sticker and a specification of the contents). Compare this with ordering a new computer from Dell. Same thing, different settings. 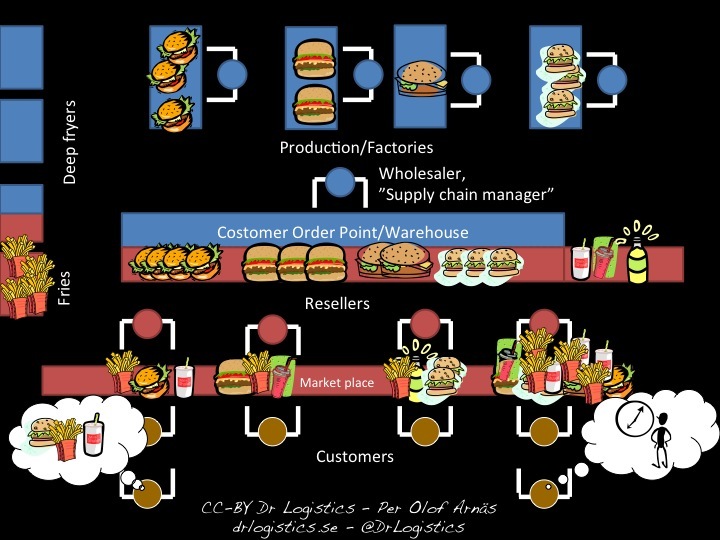 It is very easy to explain other concepts like customer order point, vendor managed inventory, merge-in-transit etc. with this model. And you are guaranteed to make an impression at the wedding dinner. And, as a closing tip, remember to use this knowledge the next time you are at a fast food restaurant. Order your burger with a special requirement (extra salad?). Then they have to make you a fresh one (you have to wait a few minutes, but it’s worth it). Fries without salt. A classic. Kryphål möjliggör road trains i Sverige!